Samsung Galaxy Note 10.1 coming to Canada in the "coming months"
The Galaxy Note 10.1 was unveiled several months back at Mobile World Congress but it looks like it will finally come to market after several changes. The Note 10.1 features a 10.1 inch 1280x800 display, 1.4GHz Quad-Core Exynos processor, 2GB of RAM, 5MP rear facing camera, 1.9MP front facing camera and of course S Pen. 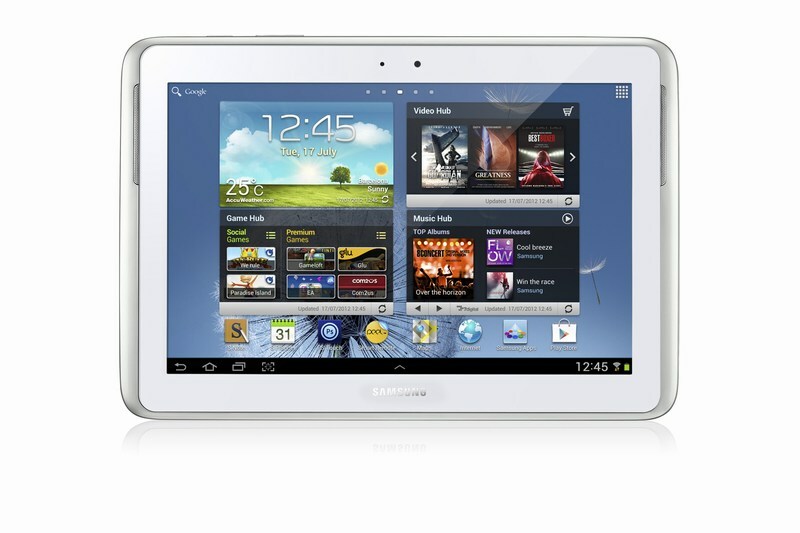 The Galaxy Note 10.1 will come in several versions including Wifi-Only, 3G and 4G LTE. We wouldn't be surprised to see Canadian carriers opt for the LTE version while big box stores will most likely sell the WiFi only version. It seems like the Note 10.1 will launch with Android 4.0 Ice Cream Sandwich but we can always hope that it be quickly updated to it. Check out the press release and video after the break. SEOUL, August 6 2012 – Samsung announced today the launch of GALAXY Note 10.1, an extension of the GALAXY Note category. GALAXY Note 10.1 is outfitted with the functionality and precision of a pen and paper on a 10.1-inch large display, providing endless possibilities to elevate a user’s creativity, productivity and learning abilities. Featuring an intuitive user experience and armed with a 1.4GHz quad-core processor and 2GB RAM for enhanced performance, GALAXY Note 10.1 is designed to simplify idea capture, information access, and multi-tasking, making each easier and faster. GALAXY Note 10.1 allows users to express their ideas naturally and efficiently. GALAXY Note 10.1 incorporates key intuitive features and capabilities such as side-by-side multitasking with the device’s Multiscreen feature on a 10.1-inch large screen; Samsung’s unique S Pen experiences including a variety of S Note templates and productive tools (Shape Match and Formula Match); Learning Hub for accessing educational curricula (Learning Hub is currently available in Korea, the UK, France, Germany, Spain, Italy, China and Singapore, and will gradually roll-out to other global markets) and Adobe’s premium creative application Photoshop® Touch. With GALAXY Note 10.1’s Multiscreen feature, users can effortlessly utilize two different applications side-by-side simultaneously for true and easy multitasking. Users can view Web pages or videos, or launch other applications while writing or sketching ideas with the S Pen on the other half of the screen. Furthermore, users can freely capture and crop images, and paste them onto the other screen to make personal notes and enhance their creativity, productivity and learning abilities. The Multiscreen feature increases productivity and efficiency while users are enjoying multimedia content. GALAXY Note 10.1 brings a new culture of creation through the user’s own notes, and enables an entirely new experience to improve productivity and enjoyment. Featuring its advanced 6.5mm S Pen, GALAXY Note 10.1 is optimized for the creation of personalized and expressive content in the most natural and intuitive way. The S Pen’s feel and functionality are specifically designed for an optimal experience on the 10.1-inch screen. The S Pen is embedded directly in the device and, when removed, automatically launches specially-optimized applications, including S Note, S Planner, Crayon physics, Adobe® Photoshop® Touch, and Polaris Office. Alternatively, users can easily set their preferred application to be launched instantly. For example, S Note can be launched instantly when a user takes the S Pen out from the device. Users can also tap the screen twice while pressing the S Pen button for quick S Note access via the S Note-dedicated widget, which can be easily moved anywhere on the display, never hindering or obstructing creativity or productivity. The S Note is a unique tool that gives users the ability to combine notes and sketches with other digital content in ready-to-use templates. The Shape Match and Formula Match features help correct and digitize geometric shapes and solve numeric formulas hand-written with the S Pen. The S Note is also integrated with knowledge search engines so that users can search for content, obtain information, and easily drag and drop content onto S Notes without having to switch between screens. Exclusively pre-loaded on GALAXY Note 10.1, the Adobe® Photoshop® Touch application allows users to professionally edit photos with the ease and precision of the S Pen. GALAXY Note 10.1 is an ideal learning tool that allows users to take notes directly on an eTextbook while watching lectures, or research the Web while writing an essay at the same time. Samsung’s Learning Hub service is optimized for GALAXY Note 10.1, allowing users to access extensive multimedia educational content for all ages. The content includes eTextbooks, video lectures, interactive coaching and much more, and can be shared with multiple Samsung devices.Furthermore, Learning Hub features a learning management system that provides schedule and performance management tools for users of all age-groups to enjoy learning at their own pace. In Korea, the UK, France, Germany, Italy, Spain, China and Singapore, Learning Hub service is available at the time of the launch of GALAXY Note 10.1. Learning Hub will be downloadable via Samsung Apps in more than 20 countries by the end of 2012. Several other features have been added to GALAXY Note 10.1 including Smart Stay, which tracks the user’s eyes to ensure that the screen is always on while being looked at, and Pop Up Play, which allows the user to watch a video anywhere on their screen while simultaneously running other tasks. With AllShare® Play, users can share content with a large group in real-time by connecting GALAXY Note 10.1 to Samsung HD TVs, mobile tablets, laptops, and other consumer electronic devices on the same network. With AllShare Group Cast, users can also share and collaborate on documents, presentations, or images without loading the files separately. GALAXY Note 10.1 comes in three connectivity options: a WiFi-only version, a WiFi-and-3G HSPA-Plus connectivity version at launch, and a WiFi-and-LTE version later this year. GALAXY Note 10.1 is available in Korea, Germany, the US and the UK while it will gradually roll-out to other global markets starting in August.